All proceeds will be directed to helping the homeless with mental illness. 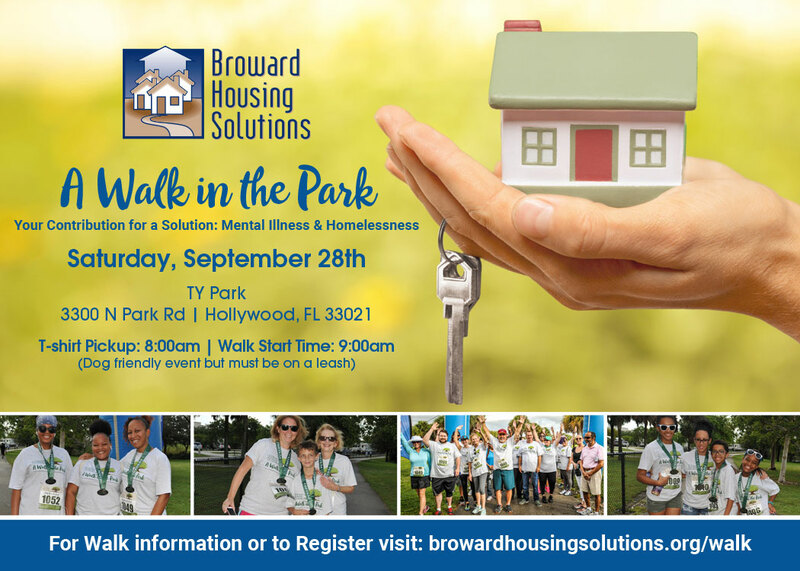 Come join us for the 2nd Annual Broward Housing Solutions® A Walk in the Park – “Your Contribution for a Solution: Mental Illness & Homelessness”. Whether you skip or walk – your support will help us fund our affordable housing programs which provide quality, permanent and affordable housing opportunities to meet the needs of lower income or homeless people with disabilities who also have mental illness. Bring the whole family even your dog (dog friendly event but must be on a 6 foot leash) – there will be activities, raffle prizes, music and lots of goodies to eat! HOW DO I GET TO SHELTER 12? Go completely around the entrance loop, past the gatehouse. Follow the signs to Shelter 12. Parking is in the large lot on the right – before you get to the shelter. CAN I BRING MY DOG? Yes, but it must be on a leash. PARKING FEE: The park does have a $1.50 fee per person, however the fee will be waived, if you let the attendant know that you are participating in the BHS® walk fundraiser. The Course of the 2nd Annual Broward Housing Solutions® A Walk in the Park – “Your Contribution for a Solution: Mental Illness & Homelessness” will feature a scenic loop around TY (Topeekeegee Yugnee) Park! The Start & Finish Line will take place in TY Park.